The family Strassburger had origin from Alsace (german Elsass) in present France. "Strassburger were known for their liberty acts with up to hundred and twenty (!) horses divided over 3 rings and also for their Olympiads, chariot races." 1916: The circus, including tent, 63 horses and 3 elephants during tour in Norway, was sold to Lorenz Hagenbeck, and was renamed Circus Carl Hagenbeck - Stellingen. 1917: After WW1 Adolf Strassburger and his brother Leopold Strassburger started a new circus Strassburger in Germany. This circus later expanded to one of Europes largest circuses, which for some years toured with 2 different lines. 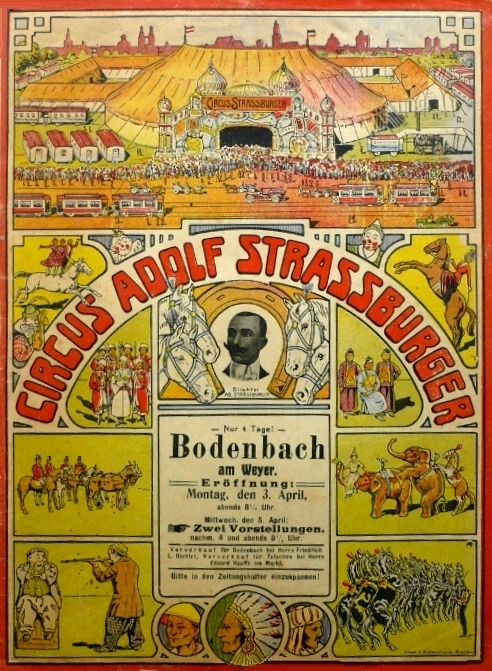 Adolfs son, Leopold Karl Strassburger, took over the circus and married his cousin, Leopolds (Adolfs brother) daughter Regina, and together with Reginas sister Elly and Karls brother Hans they brought the circus into one of the largest in europe, travelling in two units.